As well as being the portal to Big South Fork Country, Jamestown is the home of great American revolutionaries and intriguing rogues, not to mention World War I hero Sgt. Alvin C. York. With features like the landmark York Gristmill, perched along the Wolf River; world-famous 127-Sale, the world’s longest yard sale; and Highland Manor, Tennessee’s oldest winery, Jamestown provides visitors and locals a great range of cultural and consumer attractions. Even with its own municipal airport and location on U.S. Highway 127, Jamestown manages to remain seemingly tucked away in the quiet, peaceful country of the Upper Cumberland – ready for you to discover. 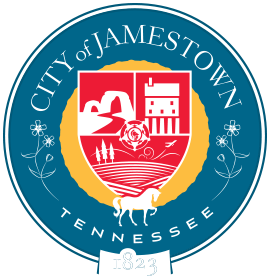 Established in 1823, the City of Jamestown is the county seat of Fentress County, both of which were named after James Fentress, a prominent Tennessee legislator who lived from 1763 to 1843. Jamestown was officially incorporated in 1837 on an area formerly referred to as “Sand Springs” because of its numerous natural springs. One of these springs still remains and is located northeast of the Fentress County Courthouse in Mark Twain City Park, so named because former first circuit court clerk John M. Clemens, father of Mark Twain (born Samuel Clemens), and his family regularly drew water from this spring before they moved to Missouri to live. Clemens drew the plans for the county’s first courthouse and jail. Another Fentress County claim to fame is that legendary World War I hero Sgt. Alvin C. York was born and raised here and continued to live here from the time he returned from the war until his death in 1964. He devoted most of his later life to raising funds for and building the Alvin C. York Agricultural Institute, which is still a functioning high school today and is one of the three state-funded schools in Tennessee. Jamestown, the Fentress County seat, sits at the intersection of U.S. 127 and Tennessee Highway 52. We are situated on the Cumberland Plateau in eastern Middle Tennessee and are near several natural wonders, including the Big South Fork National River & Recreation Area, Pickett State Park and Dale Hollow Lake. Jamestown has a moderate climate with four seasons and an annual average temperature of 54.5ºF. January temperatures average a high of 42ºF and a low of 27ºF, and July temperatures average a high of 81ºF and a low of 64ºF. 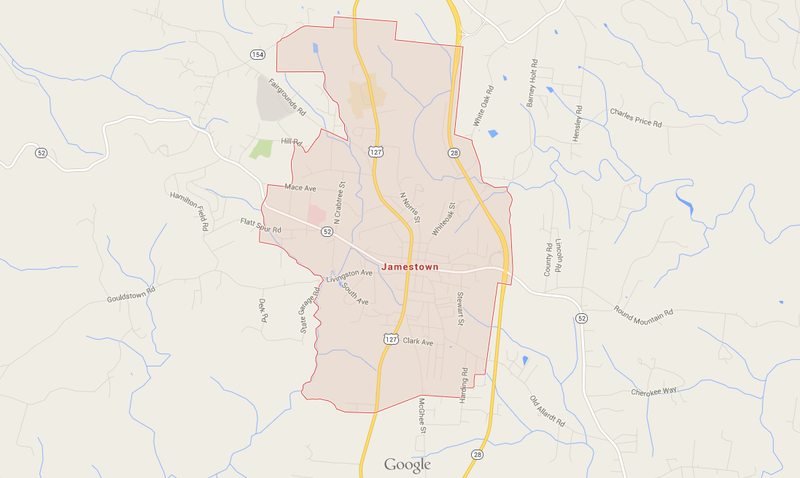 Jamestown’s average annual rainfall is 55 inches, and our average snowfall is 14 inches. Click here for current weather conditions. This park has many recreational activities for families, friends or groups to enjoy. There are pavilions available to be rented. If a pavillon is reserved it will be marked accordingly, otherwise pavillions are available on a first come basis. Our quaint and charming pocket park offers a shaded and beautifully landscaped area to sit and read a book, or just relax under the gazebo. Before the founding of Jamestown, the area was also known as "Sand Springs" for the many bubbling springs located within the city. The last remaining spring is located right here within the Mark Twain City Park. For rental information of facilities contact the City Hall at 931-879-8815, or Parks Department Superintendent, Ronnie Dishmon at 931-879-8815. Pool Parties available Monday - Friday 6 p.m. - 10 p.m., or Saturday and Sunday from 4 p.m. - 10 p.m. Known for its stunning arches, sandstone bluffs and scenic gorges surrounding the Big South Fork of the Cumberland River and its tributaries, the Big South Fork National River and Recreation Area spans 125,000 acres on the Cumberland Plateau and offers a wide array of activities for visitors, from camping and hiking to fishing, horseback riding, boating and much more. Initial development of the Pickett State Park was by the Civilian Conservation Corps (CCC) from 1934 to 1942. Today, visitors enjoy many outdoor activities this park has to offer, such as fishing, boating, hiking, swimming, and camping. The park offers 32 campsites, each with electric and water hookups, picnic tables and grills. The campground is served with a modern bathhouse and a dump station. There are also five rustic cabin available to rent; each cabin sleeps four to six people. The Pickett CCC museum memorializes and preserves the unique work of the CCC. The museum features interpretive exhibits and artifacts, depicting the Civilian Conservation Corps’ contributions to Tennessee’s parks and natural areas, while recognizing the CCC’s extensive efforts across the country. Pickett State Park has two picnic shelters/pavilions that may be reserved for your next event or gathering. Depending on the shelter, the maximum capacity ranges from 20 to 30 people. The shelters are equipped with picnic tables, a grill and access to restrooms. East Fork Stables has over 100 miles of equestrian exclusive trails, as well as horse-and-wagon trails. Riders enjoy vistas of waterfalls, rock formations, lily pad ponds and flora along their ride that is only accessible by horseback. Their trails include shady forests, sandy trails, and open fields. Riders also enjoy annual theme rides, such as the Luau ride and the Oktoberfest ride, where meals and entertainment are included. East Fork Stables also has campgrounds for tent camping or cabin rentals. Honey Creek Horse Camp is a place to bring your own horse and take in the scenery. They are open seven days a week from March through mid-December. Horse owners have 42 campsites to choose from that include restrooms and shower houses, along with covered barn stalls for their horse(s). Honey Creek also offers bunkhouse-style camping that accomodates up to 6 people that provide a microwave, coffee pot, and a single stand alone burner. Other than horseback riding at Honey Creek, campers enjoy hiking, biking, swimming, hunting, fishing and sitting around the campfire. The Pig Preserve is an innovative concept designed to provide a safe, natural, healthy life for rescued pigs of all breeds in a less labor intensive way and, hopefully, at a lower cost per pig per year than has traditionally been done. Located in Jamestown, the Alvin C. York Agricultural Institute was founded in 1926 as a cherished project of renowned World War I hero Sgt. Alvin C. York, who believed in the importance of education for the youth in his rural hometown. The school was transferred to the State of Tennessee in 1937, which continues to operate it as a public school. The 400-acre campus — designated as a Tennessee Wildlife Resources Agency wildlife management area —features five ponds and is home to a herd of Limousin cattle that students help manage. Located nine miles north of Jamestown in the Sergeant Alvin C. York Historic Park, the York Gristmill and family farm are where this celebrated World War I hero learned the value of hard work during his early life. Walk through the millhouse, which York continued to operate for many years, and splash around or fish off of the milldam on the Wolf River. The mill and farm are open April through October from 9 a.m. to 5 p.m. and November through March from 9 a.m. to 4 p.m. daily. Highland Manor Winery is located on the Cumberland Plateau amid the natural splendor of this rugged region of Tennessee. People who venture off the beaten path of the interstate can relax and enjoy the natural beauty of the Big South Fork National River and Recreation Area, Dale Hollow Lake, and Pickett State Park and culminate that pleasant experience with a visit to Highland Manor Winery. Visitors are treated royally with a tasting of our fine wines, a tour of the winery, and are invited to stay a while and enjoy the unexpected charms of Highland Manor Winery by picnicking on the grounds while enjoying the beauty of the vineyard and blueberry patch.